Istanbul is a city that offers endless opportunities for sightseeing. One such popular destination are the Prince islands which are spread out in the Marmara Sea across the Anatolian shores of the city. I have always wondered though, how many of the fourteen million inhabitants of Istanbul have actually seen these islands. A few hundred thousand or one million at the most? Personally, I can’t imagine an Istanbul without the Prince islands and I have visited them several times .. The islands, each beautiful in their own form, are spread out in the Sea of Marmara like the pearls of a necklace hung on the neck of the Bosphorus. It may be that the term archipelago, meaning a group of Islands, actually originated from this sea of islands. In the ancient times, they were called Papadonosia or islands of monks, and later the Byzantines called them the Prince islands, since any time a prince who was a successor to the throne rebelled against the emperor or was seen as a threat to the patriarchy, he was exiled to one of these islands. Before the Ottomans conquered Constantinople they had named the islands, the Red Islands. This may be because of the color of the soil, or because of the bloody history of the islands. On the orders of Sultan Mehmet II., Baltaoglu Suleyman fought the Byzantines and succeeded in conquering the Islands on April 17th, 1453, six months before Istanbul was conquered. Originally there were ten islands: some large, some small, some with fresh water springs, greenery, and pine trees; still others were dry and barren. The Greeks called the largest of the islands, Megale or “the big island”, followed by Heybeli, Burgaz (Panoromis or Antigonos), Kinali(Proti), Sedef(Pearl), Tavsan(Rabbit) Kasik(Spoon),Sivri(Oxya), Yassi (Plate); and the tenth island was named Vordonosi. Many of the inhabitants of the islands were Greeks and Armenians, and for centuries they cohabitated peacefully under the Ottoman rule. Fishing was their livelihood. They attended their churches or monasteries regularly. Goats and rabbits lived on the Prince Islands, and wild berries and pine trees grew in abundance. Very few visited the islands from the ancient city because of their rough terrain and remote location. In 1842, with the first ferryboat services, islanders were no longer isolated from the mainland. Loneliness and self sufficiency slowly became characteristics of the past. Although motor vehicles were not allowed on the islands, other changes came about which transformed the face of the islands. The rows of wooden houses were replaced with new concrete buildings. The lush forest of pine trees were plowed for roadways, and the secluded beaches were occupied with restaurants and motels. But the original settlers still kept to their familiar ways-using their horse carriages called fayton, tending to their vineyards and gardens, and attending their churches, mosques and monasteries. One day strong winds started whipping through the islands. These were political stirrings caused by the wars of the the twentieth century. Many started leaving the islands, even knowing they would miss their homes for the rest of their lives. (Cenan to read this)** In the 1960’s, the young Turkish democracy experıenced it’s fırst trip and fall. The tradition of exile from Byzantium to Ottomans continued and members of parliament who were stripped from power by a coup d'etat by the Army, were sent to one of these islands and tried there for months. On Yassiada (Island of Plate) three graves were dug for the Prime Minister and two other high ranked ministers and the so called Bloodless Revolution turned to a bloody coup like so many others in the history of the islands. My emphasis will be on the Island of Vordonisi, the least known about tenth island. This island, which once lay approximately three miles across from the shores of the suburbs Kucukyali and Bostanci, was also known as the island of Vordonos or Bordonos. A monastery,built in the ninth century by a priest named Photios, once stood on the island. Photios was a an intellectual who had studied literature of the antique world and of the early life of Christians. He lived a modest life, until one day when his brother married the sister of Empress Theodora and Photios found himself living in the imperial palace. His first title became the Commander of the Palace Guard; and later he was appointed as envoy of the Emperor to Arab countries. Around this time Ignatius, The Patriarch of Byzantium, was dismissed from the office due to an argument with the uncle of Emperor Michael involving an affair with a woman. Ignatius was castrated and exiled to a monastery in Kucukyali in the year of 858 A.D. Photios, at the young age of 38 became the Patriarch of the Byzantine Church. One of the first things Photios did, after becoming the Patriarch, was to rebel against Pope Nicholas in the Vatican. Photios announced to all Christian churches that he was not recognizing Vatican’s authority; and that he was also annexing the Bulgarian Orthodox Church to Byzantine Patriarchy. 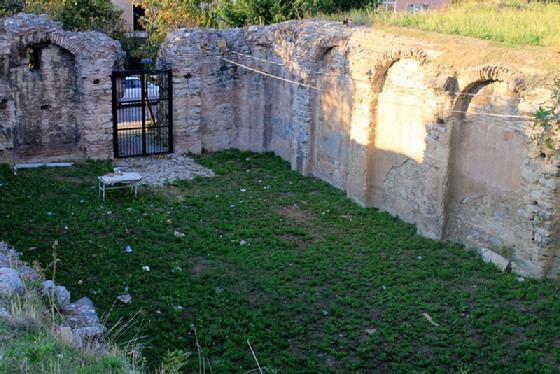 While the Christian world was contemplating this separation and Photios was concentrating on Rome, the former Patriarch Ignatius was building a huge monastery in Kucukyali, according to some, at the exact location where the Bryas Palace once stood. The building was to be called the Satyros (Satiros) Monastery. In 867 A.D., as a result of religious as well as personal struggles in the Byzantine churches, Photios was dismissed from office and exiled to the island of Vordonisi, while Ignatius was appointed, once again as the Patriarch. However, this time Ignatius followed his predecessors independent policies against Rome, without any changes, and this in turn resulted in better relations between two old rivals. As Ignatius grew older, the emperor called Photios back from exile to serve as the private tutor for his children.Soon afterwards, Ignatius died ;and Photios became the Patriarch of Byzantium once again. This time Rome and the Vatican extended an olive branch to him recognizing the status quo of his patriarchy. Then for the next twelve years he served as the Patriarch, until he was once again dismissed from the office and sent to the island of Vordonisi. The old bishop spent his last seven years of life in the opulent monastery that he had built on the island of Vordonisi across the shores of Kucukyali, where his rival had built another magnificent monastery, the Monastery of Satyros. Even after the Patriarch’s death, the two monasteries built by these two rivals, divided by a short distance on the turquoise waters of Marmara, continued to compete with each other for at least over one century. With no record of the exact date, but one day in the eleventh century, the fault line between Buyukada, the largest of Prince Islands, and shores of Dragos on the mainland started separating and breaking with a thunderous sound. As a result of the biggest earthquake. 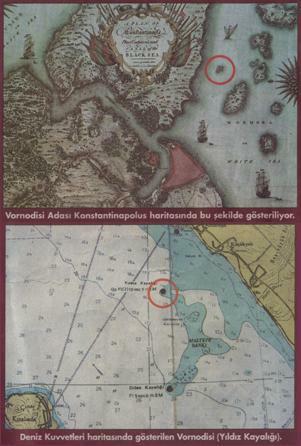 Istanbul experienced in it’s history, both the monastery of Satyros and the entire island of Vordonisi disappeared from the surface of the earth. Just like a dinosaur's sinking to the bottom of the ocean, the island of Vordonisi which was one third the size of the Kasik Adasi, the Prince Island plate, sank and disappeared with the monastery and the people on it. When finally the aftershocks ceased and the earth settled, there remained from the whole island only a protrusion of rocks above the surface of the water.For centuries afterwards people were going to tell each other the story of the island of Vordonisi and the monastery on the island. Fishermen who were not familiar with the waters of Marmara often struck the rocks and capsized, losing their boats and sometimes even their lives. In the later years, after the story of the sunken island became a myth, to warn the fishermen and sailors a sea lantern in the form of a tiny lighthouse was erected on the rocks. The rocks were called by some natives “Dilek Kayaliklari” (wish rocks) and “Manastir Kayaliklari”(Monastery rocks) by others. Today, the ferry boat service which leaves from the dock of Bostanci and sails to the Prince Islands always passes by these rocks. And the passengers on these boats, some of them who make this trip several times,do not know the story of these rocks with the tiny lighthouse; therefore do not even realize the history they are passing by. One thousand years after the Island of Vordonisi sunk, two curious men, one an archaeologist, the other a scuba diver decided to explore the unknown and plunged to the bottom of the ocean. There at a depth of ten meters, they saw some remains resembling walls of a building .The water was so clear here and the sunlight so bright like a searchlight that they easily recognized the walls which were fallen to their side. The diver, Akyunus, started scraping the seaweed and mussel layers which were 20 centimeters in thickness with his spud while his archaeologist friend, Obruk ,helped with his navigation. Akyunus then took a few photos of the walls and the mosaic floor pieces. Both were happy to have discovered the ruins of the monastery of Vordonisi. And who knows,there under the ocean, maybe they thought about this terrible day people had experienced a thousand years ago, or they thought about the two rival monasteries, one under the earth, the other under the ocean and the stories of Photios and Ignatius who had built them.